When you have an idea which grows into a 2D animated short, each step of production adds more and more information which you need to keep organized. For traditional animators, this means going from idea to thumbnail drawings to storyboard drawings, with more and more drawings generated along the way. And when you finally have a final storyboard worked out, now begins the task of making layout drawings, then rough Key poses which will then add inbetweens and finally all end up as Clean up drawings. To keep track of all the paper being added during this process, you will need to keep folders for each scene. Here is a label which you can put on each scene folder to keep track of what stage of production the scene is in as well as other useful information. The Production Manager's job is to keep track of these folder as well as to track the production schedule and keeping it up to date. 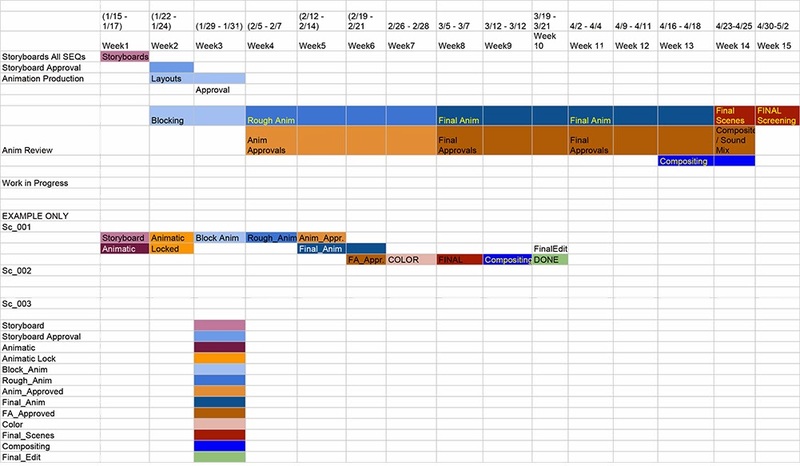 Below is an example of a production schedule which you can use to keep track of your project. 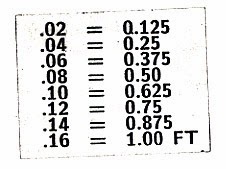 This is a timing breakdown chart for frames under 1 foot and how to calculate footage. 1 foot = 16 frames, so if the timing was 3oo , this means the scene would be 3 x 16 or 48 frames, which equals 2 seconds exactly. Once you have the storyboard, you must time out each scene in seconds and convert them into frames in order to know how much time or frames are needed to show the action. The best thing is to actually act out the scene yourself and either timing out your action or shoot reference footage of it. This timing info is usually written under the storyboard panel's shot description. After the timing for each scene has been determined, an exposure sheet is created for each scene and a folder is created for each scene. A scene is what you would call a shot in live action film-making. The exposure sheet is used in the beginning to plan out your scene and to keep track of the drawings, allowing for camera movement and breaking down the dialogue frame by frame. 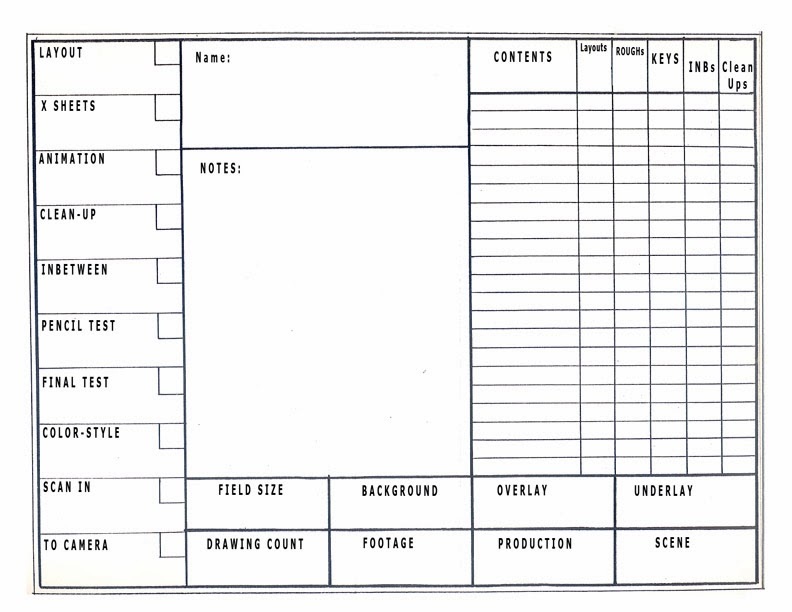 Animators need to use these sheets for every scene they create or are given to work on. Many beginning students don't understand their importance or know how to use them. Your storyboard panels will soon grow from layout drawings, to rough key poses, to Keys and rough drawings, then inbetweens and finally Clean Up drawings. Each step of production will be added to the exposure sheet to establish what frame has which drawings. And if you have separate levels, you have to use an exposure sheet to keep track of all this information. It also comes in handy if you are scanning in your drawings into a 2D software such as ToonBoom's Animate Pro. Once scanned in, you will have to reassemble the drawings to the correct layers and frames. How can you do this without an exposure sheet? The Exposure Sheet or X sheet is your friend! When beginning a 2D animation project, you begin creating more and more artwork, creating key poses, you need an exposure sheet, X sheet or Dope sheet to list what frame they will be shown on. This long sheet contains a bunch of horizontal lines, sometimes labelled. Each line represents a frame or exposure of film. Back when animation cameramen roared the earth, they used this sheet as a guide to shoot the folder of animation drawings given to them. The name "Dope sheet" meant, that all the instructions for shooting this scene were on the X sheet, so that any dope (stupid person) could shoot it. 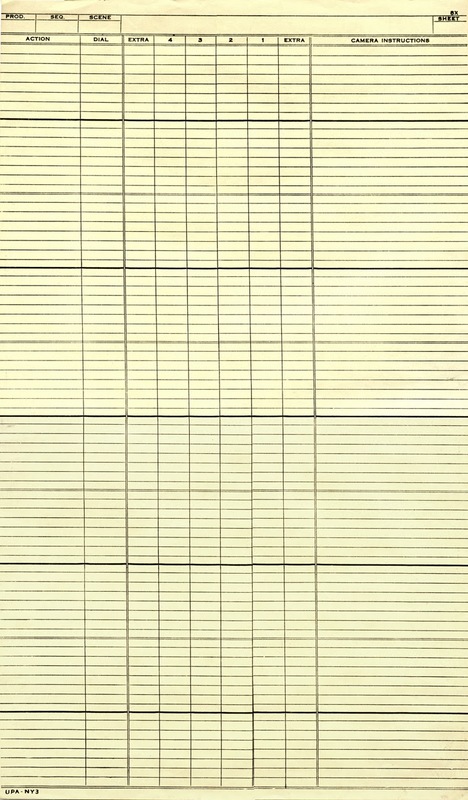 Each space between the lines on an X sheet represents a frame of film. There are 16 frames in one foot of 35mm film, the space between the darker lines lines equals 16 frames. Some animation studios would pay Animators by the footage of a scene length, however today, CG animators deal with frames and seconds instead of film footage and are usually paid by the hour or by the project. Sheet: Sheet number. Many Scenes require more than one X sheet. There are several column headings that are for different things in the scene. Action: The Director's or Animator's notes of the action happening in the scene as a frame by frame breakdown. Dial: Dialogue info is added here either as Narration or Broken down dialogue for lip sync animation. Extra: An extra level if needed. Numbered Levels 1 thru 4: Levels for animation to make up the scene. BG: Background Level is the first level with all the other levels of animation on top. Camera Instructions: Field Info, Camera movement such as a Zoom, Pan or rotation as well as camera effects like fades, wipes or dissolves. Now you have to imitate an old man as you read this... "Back when we had cel animation, you could only have 3 or 4 levels, anymore and the artwork color on the bottom level would become darker the more levels of acetate placed on top of it." Ok, now you can stop. Actually with 2D animation software, you don't have to worry about levels of animation or waiting for your cel paint to dry, because this part of traditional animation has happily bit the dust. You are so lucky you didn't have to paint cels, Hooray for Digital paint! If you learned something new, click on the ad on the right and the ad below this article, let us know you appreciate animation, Thanks!